Do you love modern décor but you’re not sure how to integrate it into your closet? With the help of More Space Place Jacksonville, you can easily get the sleek no-fuss closet you’ve always wanted. 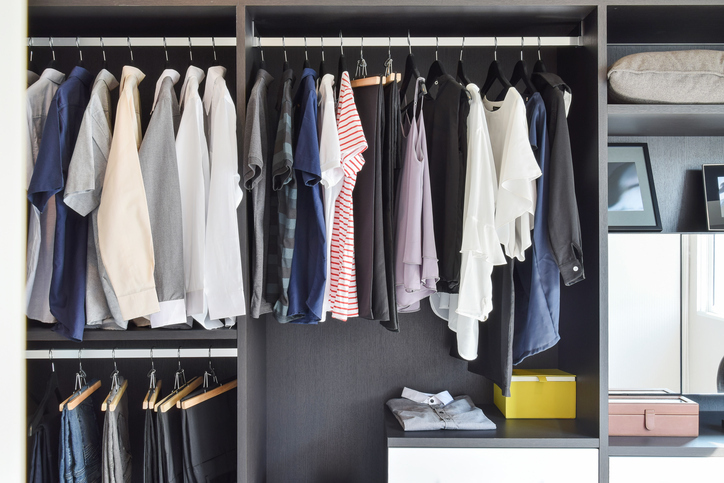 While there are many things to consider when updating any space in your home, here are the top three things you should think about when giving your closet a modern update. While traditional closets favor ornate detail, modern closets rely on the beauty of simplicity. As a whole, the modern aesthetic is characterized by a geometric style, which emerged from the Art Deco movement. An easy way to give your closet a modern feel is through clean, sleek lines. In your custom closet, More Space Place Jacksonville can install smooth closet doors, to give the closet a completely modern feel. We recommend silver hardware accents, with pulls instead of knobs. Any minimalist style handle works best. If you’re worried that the closet will lack personality, we can add in more details. One of the beautiful parts of a customized closet is that it is designed just for you. Modern style closets typically utilize a neutral color scheme. A bright closet could clash with the clothing in your closet, while a neutral tone lets your clothes be the star of the show. White paint can help make the space feel airy and open, perfect for any closet. The color is simple and refined, giving your closet the perfect modern edge. Boutique lighting in the area can help keep your space looking spacious and bright. Good lighting will also make it easier to find your clothes during early mornings. Integrating under-shelf lighting will help you get the most out of your custom closet. Even in a small room, it’s important to have space within your closet system. If your closet is cluttered, you’ll lose efficiency, waste time looking for clothes, and will be more likely to postpone organization. To help create space in your closet, More Space Place Jacksonville can install shelving, baskets, and a low-hanging rod. Regardless of the size of your room, we can help you have a spacious closet that meets all your needs. Are you ready to have the modern closet of your dreams? We can help you have a truly “wow-worthy” closet. Contact the experts at More Space Place Jacksonville today!